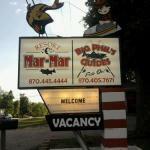 Fishing is the focus at Mar Mar Resort just an eight-minute walk from the Bull Shoals Lake boat dock. Rooms come with free Wi-Fi and at the on-site tackle shop you can find out where the fish are biting. The single-story 13-room hotel has free Wi-Fi cable TV a refrigerator and a microwave in every room. Non-smoking rooms are available and some rooms come with kitchenettes. At the on-site tackle shop you can pick up gear and arrange for a professional fishing guide. Other amenities include a playground for the kids a horseshoe pit barbeque grills and picnic tables. Pets are welcome for an additional fee. Free parking includes space for trailers and boats. At the Mar Mar resort you're eight minutes by foot and less than a half-mile by car from the boat dock at Bull Shoals Lake. Great trout fishing is a mile away on the White River. It's a 46-mile drive to the Boone County Airport.